Download Dark Resume CV Template PSD. This is a Free Resume CV Template which is perfect for you if you want to showcase your talent and skills when applying for a new job. This Creative Resume Design Template PSD is specially designed for web designer, web developer but you can quickly customise and can be used by anyone. So If you are a creative or graphic designer, then you may want a creative resume to match it and this free resume template will defiantly help you achieve the same result. This Dark Resume CV Template is also best for the showing skills, work experience, education & other information in professional way. 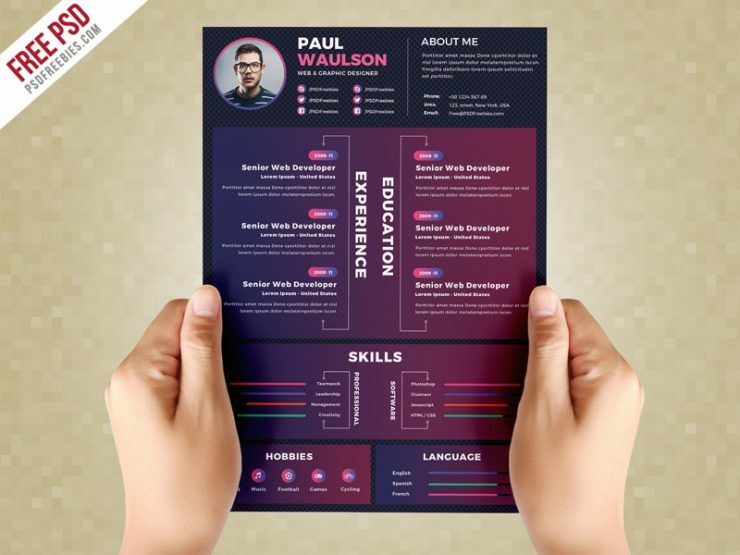 The Resume template PSD can be edited using Adobe Photoshop and It comes in A4 size print ready and available in CMYK colors with 300 DPI high resolution. You can easily customise and change text, colors, and to add or remove design elements according to your needs. Hope you like this Dark Resume CV Template PSD. Enjoy!